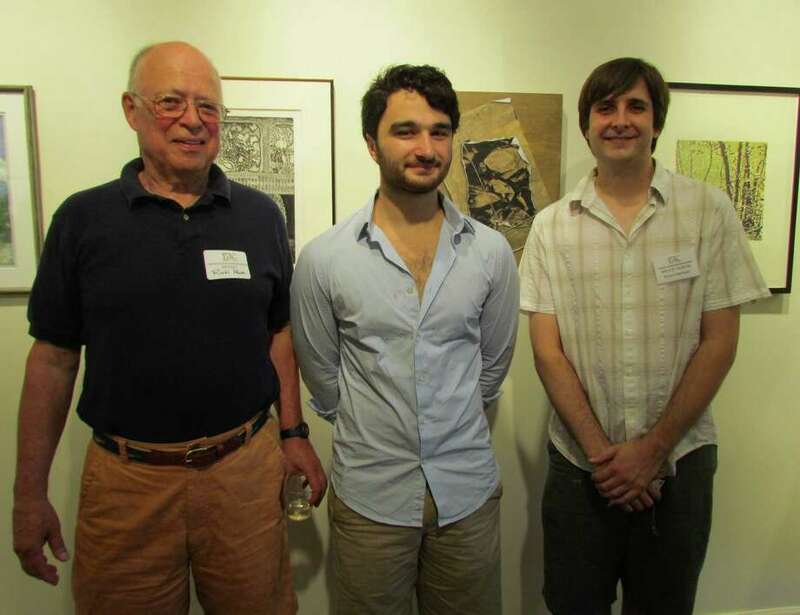 Rick Pank, Keith Appleby and Bruce Horan at the opening reception for "Beyond Brushwork" Sunday, Aug. 5, 2012, at the Rowayton Arts Center. The exhibit runs through Aug. 26. Darien and Norwalk artists are among the award winners in "Beyond Brushwork," an exhibition of computer art, drawings, mixed media, pastels and prints at the Rowayton Arts Center. Darien winners are Diane Weeks (First Prints) and Bruce Horan (Third Prints). Norwalk winners are Eunice Roy (First Pastels), Keith Appleby (Second Drawings) and Rick Pank (Third Computer Art). Other local artists in the exhibition include Joanna Bridges, Pam Lindberg and Lisa Thoren, all of Darien; and Ilana Appleby, Betty Ball, Michael Boll, N. Robert Cestone, Joel Flora, Hanneke Goedkoop, Dana Laird, Andrea Letters and Margo Reynolds Packer, all of Norwalk. The winners were selected by award-winning illustrator Naiad Einsel from 44 submissions by RAC exhibiting members. "It was an honor and a pleasure to be invited to judge the `Beyond Brushwork' exhibit at the Rowayton Arts Center," Einsel said. "My choices were based primarily on originality of ideas, rather than technique. I was very impressed with the talent of all the artists." For more than 50 years the Rowayton Arts Center has been a community cultural hub that offers an environment for regional artists to exhibit and sell their work, exchange arts-related ideas, and participate in classes and workshops for creative people of all ages and at all levels. The exhibit will continue through Aug. 26 at the RAC Gallery, 145 Rowayton Ave. The gallery is open from noon to 5 p.m. Tuesday through Saturday and 1 to 4 p.m. on Sundays. Admission is free. For information, visit www.rowaytonartscenter.org or call 203-866-2744.